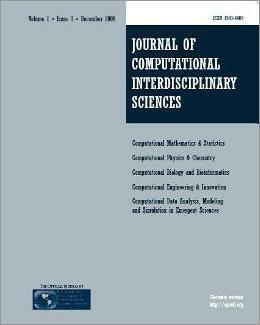 The Journal of Computational Interdisciplinary Sciences (JCIS) is the official journal of Pan-American Association of Computational Interdisciplinary Sciences (PACIS). The main objective of the JCIS is to publish original research findings in the fields covered by the Scientific Committees of PACIS. The Editorial Board coordinates and evaluates the articles to be published. JCIS is published three times a year: Issue 1 (Mar/Apr); Issue 2 (Jul/Aug); Issue 3 (Nov/Dec). The abbreviated title of the journal is J. Comp. Int. Sci., which should be used in bibliographies, footnotes and bibliographical references and strips. E. S. Almeida, I. Koga, M. A. A. Santana, P. L. O. Guimarães, L. M. Sugawara and T. Eklin. T. L. R. Sabino, G. G. Tavares, L. Goliatt, M. Lobosco, R. Weber dos Santos and F. de Oliveira Chaves. D. S. Souza, F. L. Marquezino and A. A. B. Lima. R. F. B. Marujo, L. M. G. Fonseca, T. S. Korting, H.N. Bendini, G. R. Queiroz, L. Vinhas and K. R. Ferreira.